Our last post looked at the Grand Rapids Press editorials on the 1963 March on Washington, with the main editorial practicing what we name as a form of white paternalism. Today’s post takes a look at the GR Press coverage of the 1963 march in Detroit and later in Washington DC. 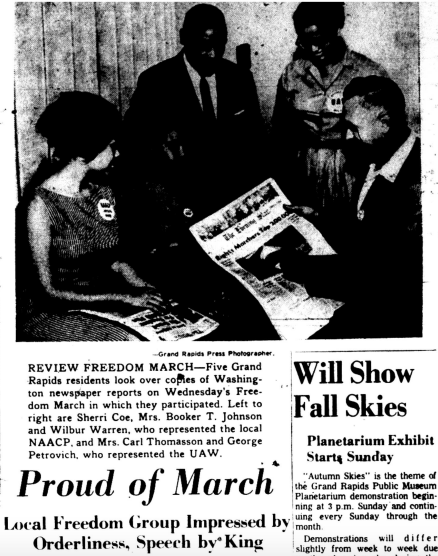 There were two articles in the Grand Rapids Press (Pages 1 – 4) about the march on Detroit in June of 1963, some two months before the march on Washington. Neither of the articles on the Detroit march were on the front page and a great deal of the focus was on whether or not the march was peaceful. There was some coverage of the fact that a list of demands on civil rights were made, but only a few of those demands were mentioned in the articles. The June 23, 1963 march on Detroit was organized primarily by Dr. King’s organization, the Southern Christian Leadership Conference and the UAW. Both Dr. Martin Luther King Jr. and the UAW President Walter Reuther were featured speakers at the march. In many ways, the Detroit march was held as sort of a test run to see if these organizations could pull off a march with hundreds of thousands of people. Detroit was chosen because the UAW had a large number of union members in the Motor City and Detroit was also one of the most critical northern cities with a major black population that was representative of police violence against blacks and other forms of structural racism. The first article on the 1963 march on Washington, DC, is a piece about the various groups that were organization delegations to participate. The GR Press article (on page 5) states that the UAW, the NAACP and the Congress on Racial Equality (CORE), were all sending people to participate in the historic march. The same article in the GR Press mentions that the AFL-CIO, the Grand Rapids Urban League and the Human Relations Commission from the City of Grand Rapids, did not send their members to the historic march. The national mainstream news coverage of the march on Washington was obsessed with the idea that the only way that the march could be successful would be if it was passive and orderly. In fact, most of the major labor organizations and the Catholic Church told Dr. King and the other Civil Rights leaders that if civil disobedience would be part of the march, they would pull their support. Another aspect of the march on Washington, DC in 1963, which is rarely discussed or even acknowledged, is that the Federal government had mobilized the military and law enforcement to make sure that people were not going to disrupt business as usual in the nation’s capital. This was the context in which the march took place, in terms of what the state was willing to allow those march to do. On page 10 of the document, the Grand Rapids Press did publish a list of the 10 demands that the marchers were bringing to the nation’s capital that day. The very next article on page 11 & 12, shows markers from Grand Rapids meeting with then Congressman Gerald R. Ford, with a headline reflecting how Congress was not in a hurry to listed to the demands of the marchers. One final article from the Grand Rapids Press coverage of the 1963 March on Washington, was written after the marchers had returned from DC. The photo that accompanies the article shows 5 people, 4 with the NAACP and one from the UAW, looking at newspaper coverage of the march. The article that accompanied the photo provided some basic reflection from the 5 featured in the article, about what they liked and what they were impressed by. 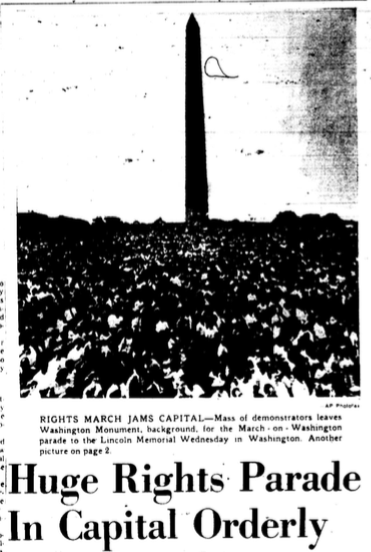 Unfortunately, the article did not reflect any sense of urgency that the marchers had brought to DC that day, not much of a sense of the efforts put into making the march happen or the larger historical context of the 1963 march on Washington. Besides Gary Younge’s book, The Speech, another excellent resource is, Nobody Turn Me Around: A People’s History of the 1963 March on Washington, by Charles Euchner. 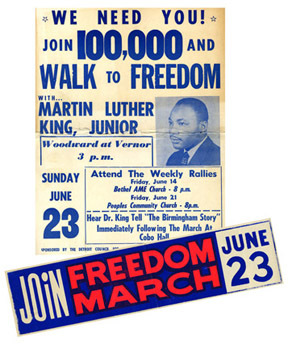 This entry was posted in Civil Rights/Freedom Movement and tagged 1963 march on Detroit, GR Press and the 1963 march on Washington, Grand Rapids groups participating in the 1963 march on Washington. Bookmark the permalink.